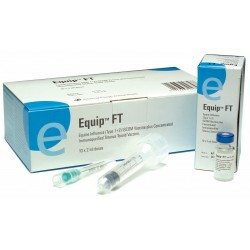 For the active immunisation of horses aged 5 months of age or older against Equine Influenza (EU or US strains) to reduce the clinical signs and virus excretion after infection, and against tetanus to prevent mortality. Equip FT stimulates active immunity against equine influenza virus and tetanus by eliciting both a cell mediated immune response and a humoral response. Onset of immunity is within 2 weeks of completion of the primary course, with duration of immunity of at least 15 months for the influenza and 36 months for the tetanus.